Everyone needs a few quick and easy dessert ideas which they can whip up in minutes. Preferably, not just any ‘ole quick recipe, but one that mimics having spent quite a bit of time in the kitchen. Guess what? This is it! 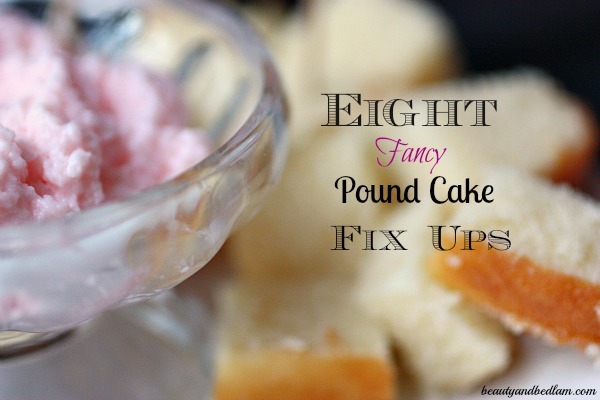 Eight, Fancy, Pound cake, Fix up ideas. Especially when schedules get so crazy and we aren’t quite sure which way is forward, I like to eliminate any “stressers” in my day to day life, and hopefully, by providing you with this post, one of those dessert stressers can be crossed off your list. Beat together equal parts of soft style cream cheese and strawberry yogurt or other yogurt. Cut your frozen loaf of pound cake into cubes and serve with tooth picks. Dip cakes into cream cheese mixture. Drizzle the pound cakes with chocolate ice-cream topping or hot fudge and caramel topping. 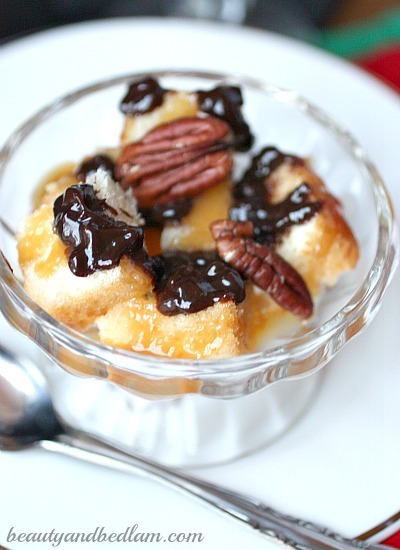 Top with pecans and a dab of whip cream, if you prefer. Slice the thawed pound cake horizontally in half. Spread soft style cream cheese (or whipped) on bottom layer and then top with strawberry preserves (or your favorite preference.) Replace top cake layer and then top with additional cream cheese and melted preserves. Since I love my cream cheese sweeter, I mixed in a bit of sugar to sweeten it or you could just use strawberry cream cheese as well. The variation from the last idea is in the cut and the ingredients. Cut the thawed pound cake horizontally into three layers. Fold one cup of thinly sliced strawberries into 1/2 cup of strawberry yogurt and then spread between the layers. Serve with whip cream and berries. Fresh is the best, but since it’s the middle of winter, I did substitute frozen and it was delicious as well. Idea 5: Ricotta and sheer yum! While this variation may not sound nearly as delicious, it’s one of my favorites. This mixture is rich and unique. 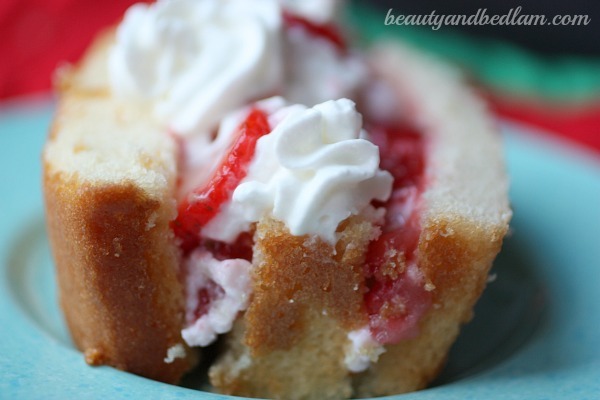 If I have a large group coming over, I make a trifle using pound cake as the base nearly every time. They all stem from my Strawberry Cheesecake Trifle, but now I add variation. 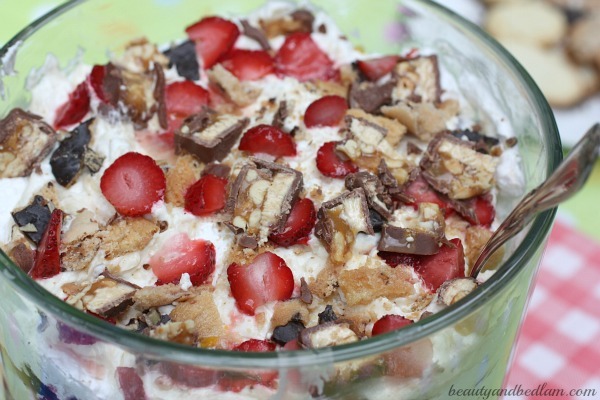 Fruit trifles, Strawberries, snickers and drizzled chocolate, strawberry, chocolate and bananas – you get the idea. You can not go wrong with Trifles for any kind of entertaining. 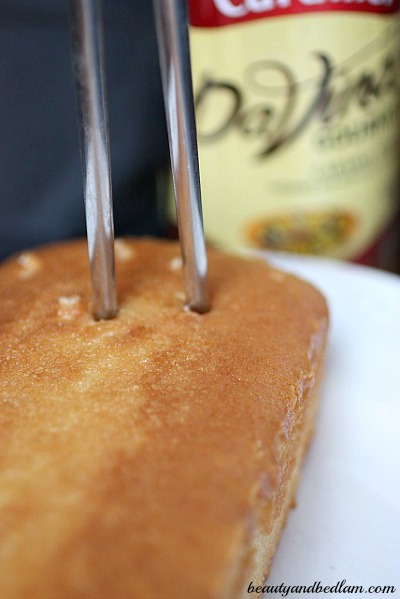 Using a long fork, poke holes into the top of the thawed pound cake. 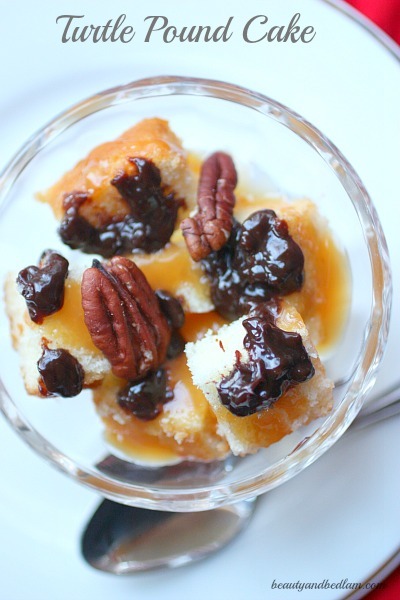 Drizzle with your favorite liqueur or flavored coffee syrup. Serve immediately or cover and chill for 3- 24 hours. 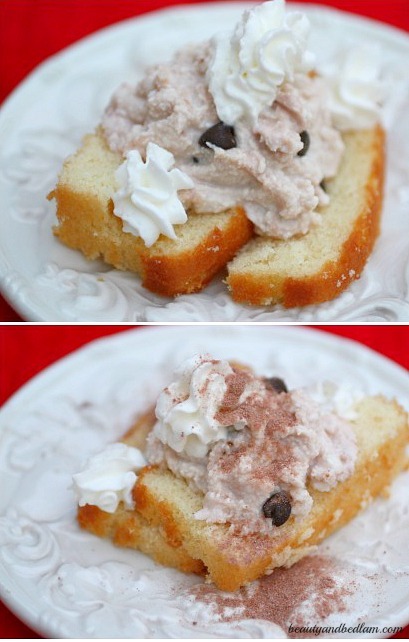 Before serving, cut the cake into slices and serve with lots of yummy whipped cream. Slice cake horizontally into three layers like Idea Four. Spread lemon curd between layers and serve with whipped cream. Top with cute curled lemon peel, if desired. I know there are probably so many more wonderful ideas for dressing up our pound cake, but my kids have efficiently eaten all of our cake right up, so my brainstorming comes to an end. 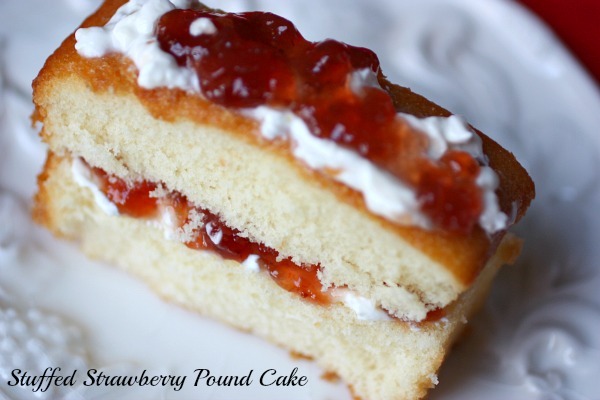 What are your favorite ways to eat Pound Cake? For more Simple Holiday Recipes, search here. 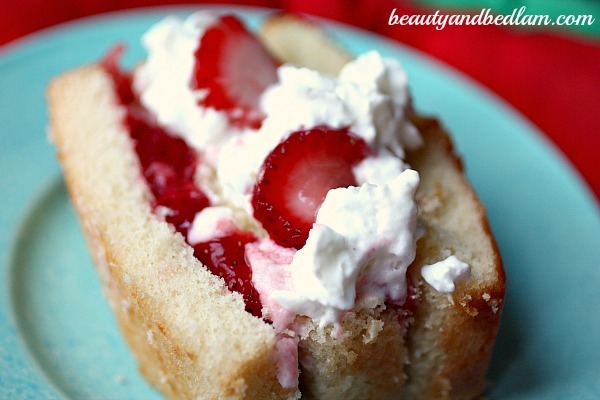 If these pound cake ideas are helpful, I’d love if you’d share this post with your friends. Yum… they all look great to me! This is how uptight I am, I read “sanitary saver” twice in my head and thought “what could that be about”. When I realized what it actually said i decided I owed it to me to buy poundcake for desserts. Thank you! I like to slice it and toast it under the broiler, then add a little butter and jam or fresh berries. Toasting it really enhances the flavour! i know that this post was originally years ago but had to comment because we have the best pound cake serving suggestion. (for peach season only.) slice the pound cake like your strawberry cream cheese layered but instead layer with fresh whipped cream and thinly sliced ripe fresh peaches. It’s to die for! Oh Kristen – that sounds amazing and peach season is SOON here in NC. Excited! I enjoy topping most pound cakes with home made vanilla custard. Sometimes, for additional color and flavor, I swirl some M&Ms (mini or regular) into the custard before spooning it on the pound cake. Just be sure that the M$Ms are at room temperature first. For recipe with ricotta cheese and white cream de cocoa, you said you used powered hot cocoa for cream de cocoa. Did you mix the cocoa with water, or just use the powdered mix? Maybe the 1/4 cup liquid does not make enough difference to matter. Toast slices and top them with a scoop of ice cream, a drizzle of chocolate sauce or some fresh strawberries. A dollop of whipped cream on top finishes it off!